This Garden Angel Girl features an kneeling angel with a Shamrock wreath around her head. 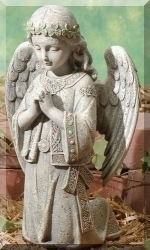 This pretty Angel Statue features a Celtic design & is from Joseph's Studio. It is made from a resin-stone mix so it is weatherproof & unbreakable. This Celtic Angel would be a nice Irish Gift for any home or garden!